Seat covers for the Kawasaki Mule Transport are made from 600 denier PVC backed Polyester and use Elastic around outer edge to attach under seat bottom and seat back. 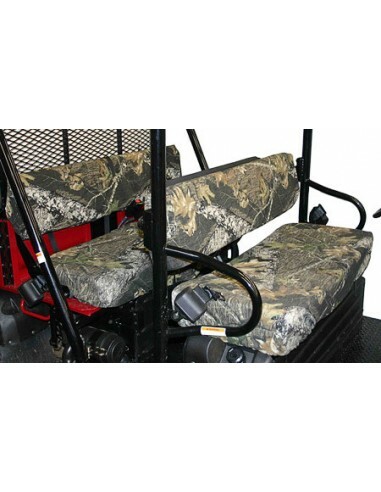 Priced as set of four covers (front and rear bench seat and backrests). Fits 3010 or 4010 Kawasaki Mule Transport models. 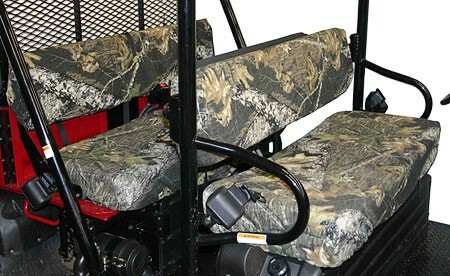 Available in Mossy Oak Breakup, Black or Grey styles. Note: These are custom made to order in the USA - May sometimes take 1-3 weeks processing time (They usually ship sooner however, depending on workload and material supply).